Both hypotheses apply to any connected, relatively closed environment of some kind, which very much includes everything from traditional marketplaces, online communities, app stores, cloud services, SaaS, enterprise social networks, social media, and cable/video networks to e-mail, telephones, and package delivery. I cite these, as many practitioners don’t even consider system concepts when trying to figure out why they aren’t succeeding as hoped, despite those very ideas defining the rules of the playing field they’re working upon. Both Red Queen and network effects have years of rigorous research and thinking to back them up, and as far as they go, they make real sense of the modern world as explanations for why things are the way they are in various places. This includes how organisms compete, survive, and thrive in the natural world or how networked products and services grow and maintain dominance on the Internet, respectively. These combined environments will ultimately lead to what I’m currently calling the 4th Platform. What triggered this line of thinking was Gartner’s fascinating new report on the Magic Quadrant for Cloud Infrastructure, which makes the stunning claim that Amazon now has 10 times more cloud computing capacity in use than the entire total of all the other 14 providers combined. The company is deeply wired into over a million customers’ ecosystems, and thousands of online products. By any estimation it is uncatchable. Sidebar: Interestingly, this hasn’t stopped technology leaders such as Staples CIO Tom Conophy from stating last week that they’re going after Amazon “in a big way.” This despite the fact that both organizations aren’t even playing on the same digital meta-level. Or is Amazon uncatchable? Don’t we just need to go ‘up the stack.’ As it turns out, not if it just leads to commoditization. If traditional enterprises — and yes, more likely, startups — can only understand the fundamental rules by which the Amazon, Apple, and Facebook et al became leaders, the reasoning goes, we should be able to use those very rules against them. We should then be collectively able to out-innovate, out-invest, out-maneuver our competition and get to the top of an increasingly shallow but very, very steeply inclined pile of winners. Deep thinkers in this space like my industry colleague Simon Wardley note that network effects create enormous inertia for change that make it very hard for a new player to get started, even if they’re much, much better. Worse, this is true even if you realize this and try to organize and optimize for it. You are simply spitting in the wind. 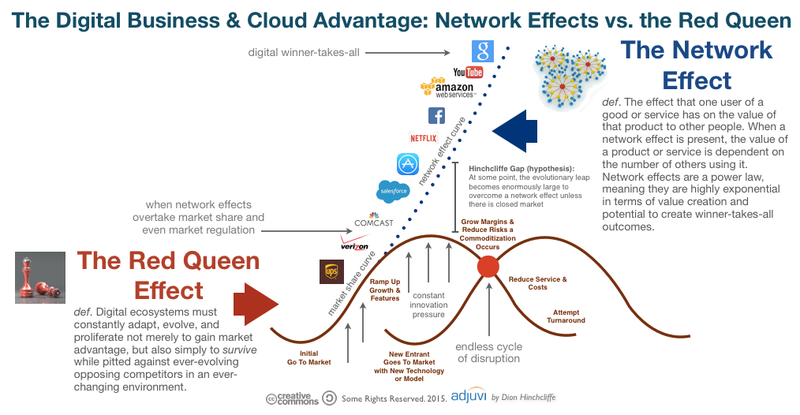 Market-leading network effects, in fact, nearly always easily trumps the seemingly-powerful Red Queen Effect. None of this is a new discussion of course, and the power laws of digital networks, such as Reed’s Law, have been relatively well-understood for at least decade. But their effects are now inexorably felt in the traditional business world like never before. Count on nearly everything in the ecosystem to eventually drop to effectively zero cost. Do not build your digital business along the commoditization axis. Only the underlying properties, like network effects, are exempted from this rule and this is a potent realization. We will eventually get the cost of nearly all technology to nothing, making replication and competition both easy and rampant. This isn’t where most businesses would like to be. However, network relationships like communities, total aggregate API integrations of partners, total daily users contributing value, these cannot never be copied whole cloth on an increasingly low cost scale. When people are involved, commoditization is not possible, and real, meaningful human relationships then become the strategic coin of the digital realm. Use differentiated models for commodity elements of digital business, versus the methods you employ for the innovative (and most important) elements. Social business, bi-modal IT (actually, tri-modal), devops, and even agile, are still the mantra here. These methods have been discovered to operate on the scale, speed, and collaborative dimensions required of today’s rapid digital cadence. Even better, they connect people the best way — that we know of so far — with how modern technology profoundly alters and — mostly — improves the way we work. If you are a large organization, you’ll have to operate in sometimes truly unexpected new ways to deliver well on digital. In particular, this means powerful new network models of organization structure — in IT and everywhere else — as well as new widespread digital workplace skills to be able to change at a sufficiently high and sustained rate. In other words, most organizations must rapidly evolve their operating models to adapt to the rules of the digital networks. A few have, but most still have not. There’s still time in a few industries however, but not a tremendous amount. For most, however, it’s now later than they think.